In the fourth part of the restoration series, Sam Okell and Giles Martin explain their decisions. 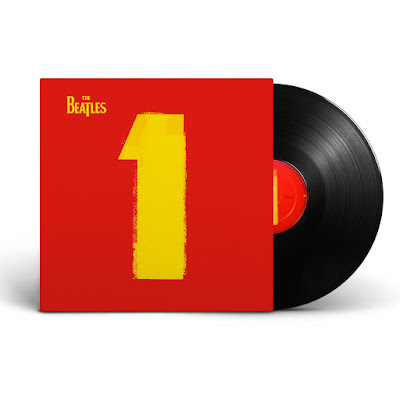 The vinyl edition of "Beatles 1" with the new stereo mixes will be out on December 4. So here it is, the new "Penny Lane" video. This video has been rescued from a positive film with faded colours. And the restoration crew has indeed been able to correct the colours, although they are perhaps more subdued than we remember from the old 2-inch U-matic video tape the previous restoration came from. 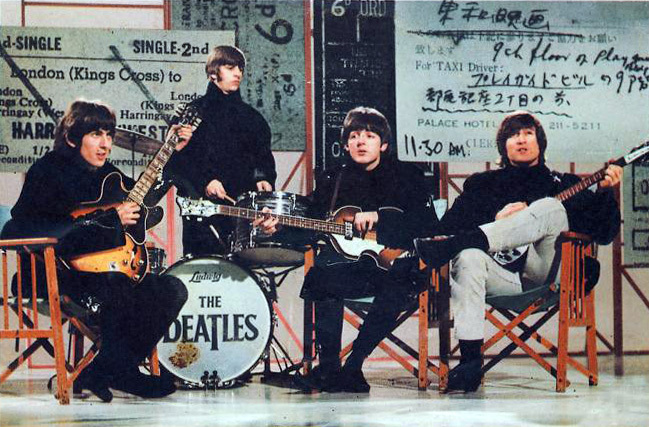 The skin tones vary a bit throughout but in general, the Beatles look winterly pale and their bright (newly colourised?) red coats make the contrast stand out even more. It also looks like they have inserted a few shots from the trimmings, which look more like a natural colour. 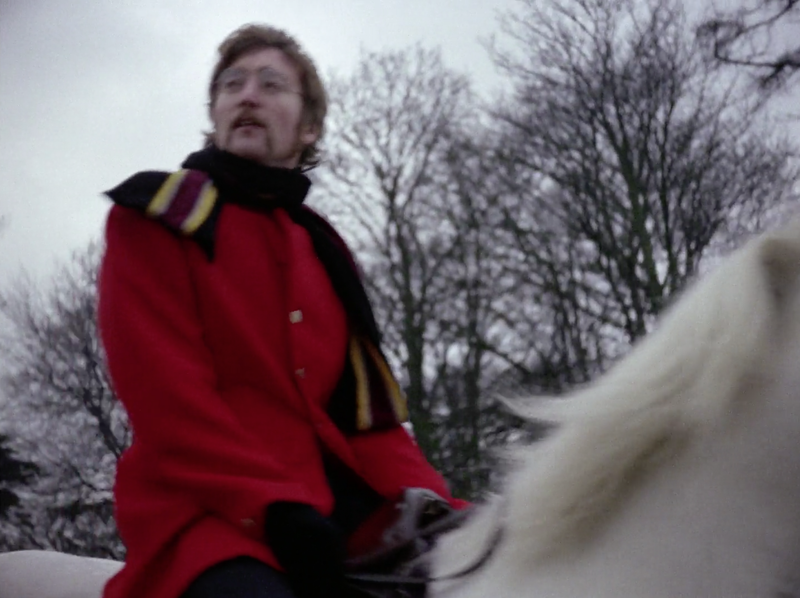 Does the shot above of Lennon on horseback look familiar to you? It's nowhere to be found in the video that was made from the U-matic video tape in 1992, it wasn't in the original video from 1967, and here in the new version it appears at 1:53. "Penny Lane remix? Sterile, unemotional, everything stands out, nothing blends, all subtlety gone, sounds like 20 overdubs all on separate lines being squeezed together to make one artificial picture. Too much top end EQ on everything, no soul, just clinical sound from a mixer (no idea who it is) that decided that "the Beatles need to be brought into the 21st century". The original (mono or stereo) at least has heart and sounds like a "whole" of something. The remix sounds like someone broke a china teacup, glued it together and shone a big light on it. "Hear what I did? I "fixed" this song. It's good now." "Horrible thing to do to such a classic song." So the quick shot of John here is new, making this a new edit, however unobtrusive. New Say Say Say 12-inch single for RSD. 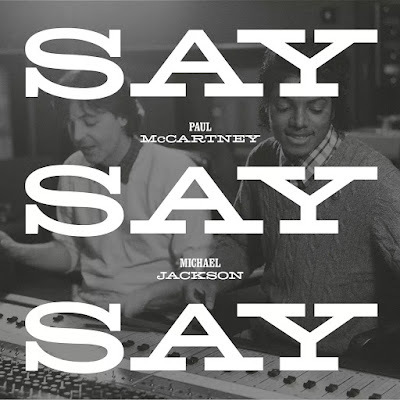 2015 remix of the 1983 hit "Say Say Say", originally recorded with Michael Jackson for the album Pipes of Peace. Artwork features silver and black ink with a graphite finish, and the vinyl is transparent. B-side is an instrumental version of the song. This remix is exclusive to this limited edition piece. "Say Say Say (2015 Remix)"/"Say Say Say (Instrumental)"
Available from stores participating in Record Store Day's "Black Friday", November 27, 2015. As "A Day In The Life" was made available yesterday on a Mashable page, sourced from Vevo, this clip was only available in the countries where Vevo works. Today it was published on The Beatles' Vevo YouTube channel as the window of exclusivity closed. Promoting Beatles 1+ , this is A Day In The Life as it looks now. Miguel Carrera has sent us the following index of The Beatles' official music videos. While mostly of importance for video collectors, the list reveals that Apple has been working on promotional videos for a long time, and it also sheds light on an earlier attempt of making a "Beatles 1" compilation in 2011. In the following, I have used descriptions from my own article on the subject from January 2015, and I have also changed Carrera's chronology. Some videos were filmed a particular year, but remained unreleased at the time. 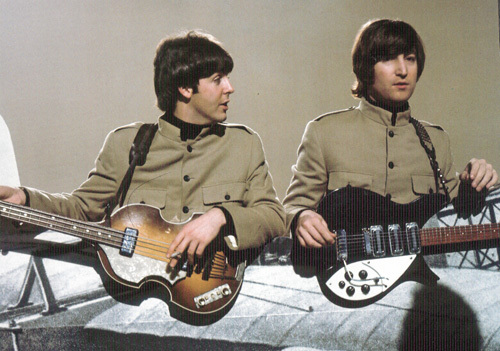 Many appeared through the years until the Anthology project was released, or later. Indicated here: Year it was filmed but for the most part the year a clip became an official "music video". If the same version was used to promote different official releases over the years, the changing only of the slate and the closing credits with year of release is also included. 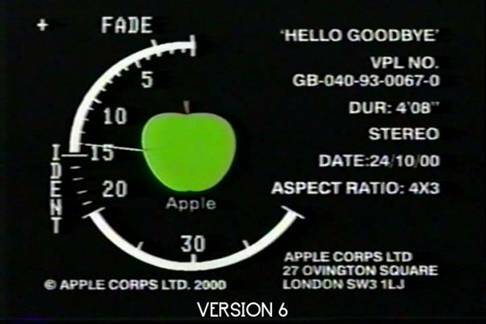 All the variations over the years, available sometimes from the masters that Intertel/Apple/EMI created, or good to very good copies of them, with original VRT or clock ("w/slate") and with a few exceptions these are not taken from TV or music channels. Only official videos are included here, no clips from TV shows, like "The Music of Lennon & McCartney", or concerts that have appeared over the years on bootlegs or fan made compilations like "Chronology", "By the Bushel", "Unsurpassed Promos", etc. Clips from the movies/concerts or TV shows are included only when they come with the original Apple VTR slate, which means it's an official video clip, and not a "fan-made compilation", extracting all songs from the movies to create "Lost Videos" compilations. Also, no fakes here. If you can’t find a particular video that you may recall having seen, it was either taken directly from the movies or was a fake. 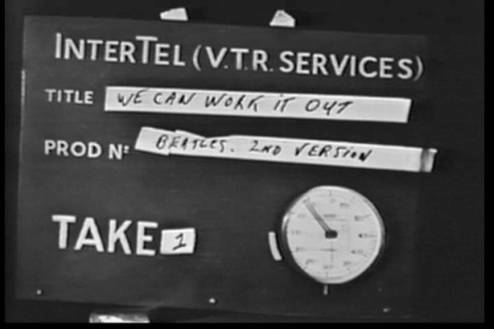 Also, no "outtakes", or videos created from the outtakes (like "Rain", "Paperback Writer", "Strawberry Fields Forever", "I Am The Walrus", "A Day in the Life" etc, that have appeared recently on a few HMC titles or YouTube are described here. "Beatles 1+" claims it will be giving us 50 music videos, but actually only 35 of these, plus four newly created ones are actual videos, the rest are clips from the movies, TV-shows or concerts, which we only now will have to count as official “videos” as well. 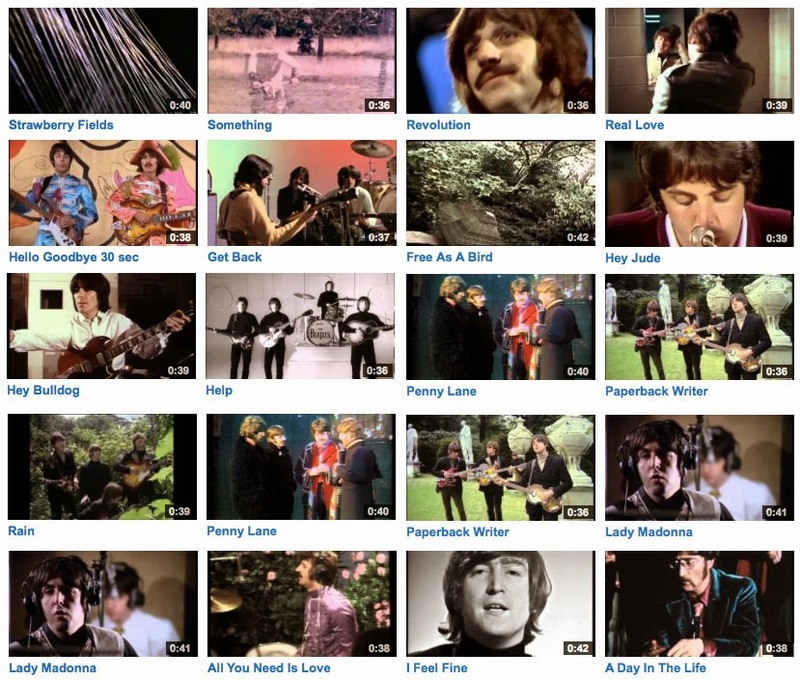 Circulating among video collectors there are over 120 Beatles music videos. 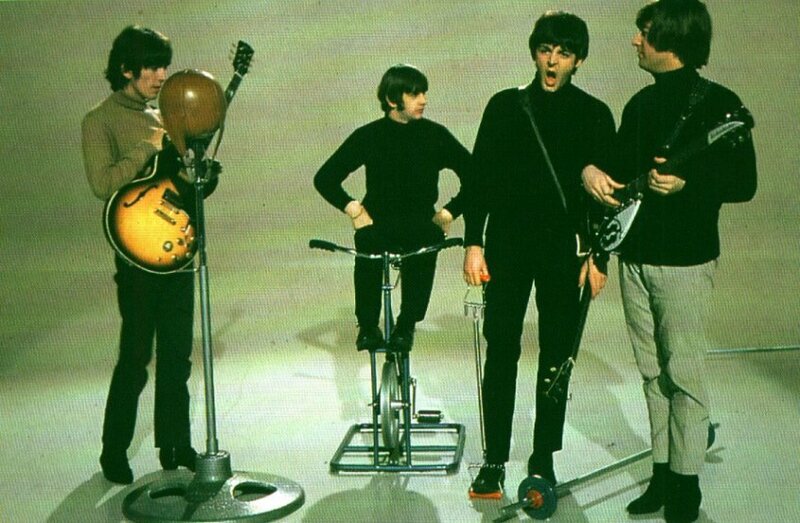 On 22 April 1965 Richard Lester shot The Beatles performing the song at Twickenham Film Studios in London. The black and white clip, meant to simulate a television performance, served two purposes. The first was that it was used in the opening of the movie as the film at which the villain Klang (played by Leo McKern) throws darts. 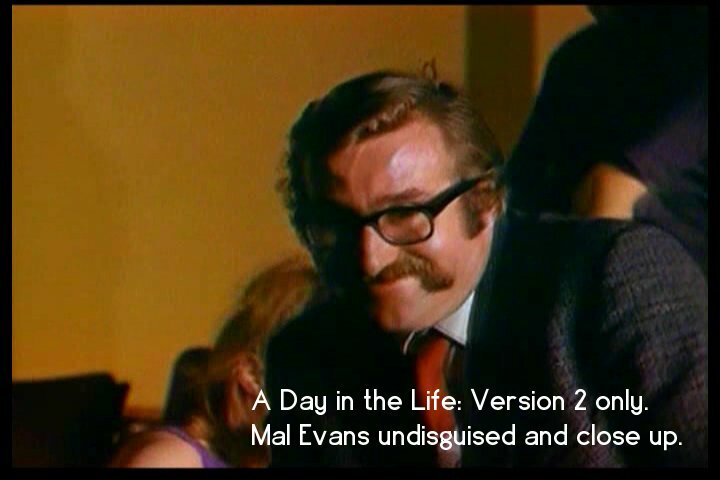 The second ( a different edit) was as a promotional film that could be sent to various television programmes. 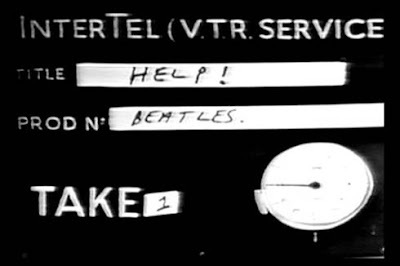 The “Help!” promotional film aired on Thank Your Lucky Stars on ITV on 17 July 1965 and on Top of the Pops on the BBC on 29 July 1965. 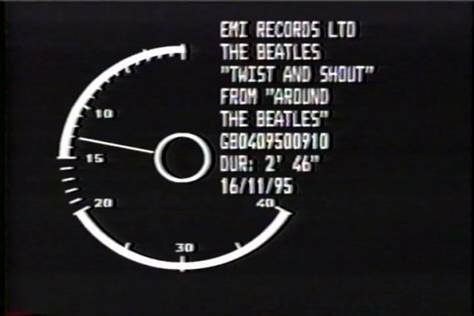 A little bit of it was later successfully used as part of the opening shot of the Beatles' Anthology TV series. From 1965 to 1968, film company Intertel provided all facilities to record the videos, that’s why they are referred by the fans as the “Intertel” versions. 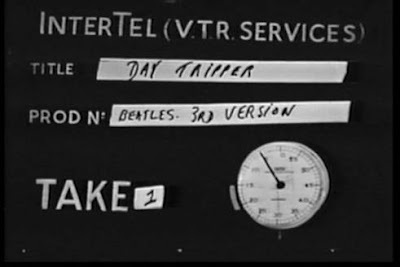 The batch of ten music videos, made on November 25th, 1965, also shot at Twickenham, but by Intertel (V.T.R. Services) Ltd., were quick to make. They were "Help!," "We Can Work It Out" (three versions), "Day Tripper" (three versions)," "Ticket To Ride" and "I Feel Fine" (two versions). Directed by Joe McGrath. 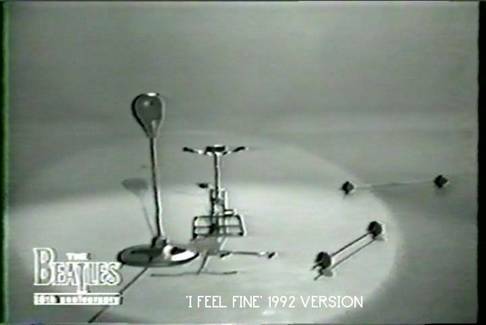 I Feel Fine version 1 (w/slate) *First broadcast on ‘Top of The Pops’, December 1965. Day Tripper version #2 (black turtle neck, w/slate) *Version #1 was reported to be similar to #2. 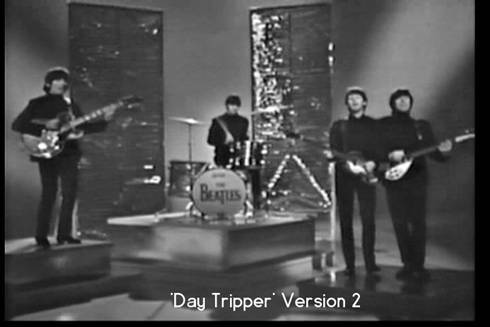 Day Tripper version #3 (Shea Jackets, w/slate) *First broadcast on ‘Hullabaloo’, January 3, 1966. 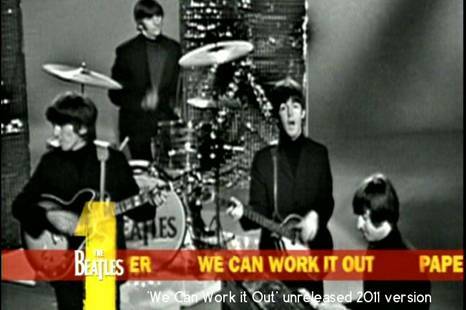 We Can Work It Out version #1 (black turtle neck w/slate) *First broadcast on ‘Hullabaloo’, January 3, 1966. Photo released to promote the 2015 edition of "Beatles 1". 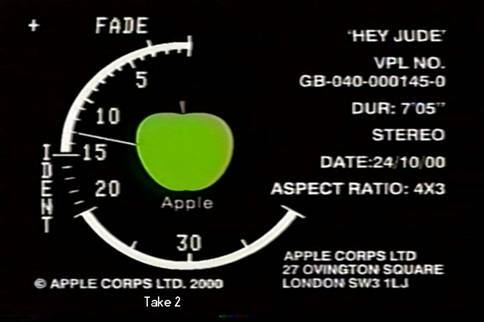 Photo: Apple Corps Ltd.
Colour photo provided by our reader, Marcelo Ravelo from Barcelona. 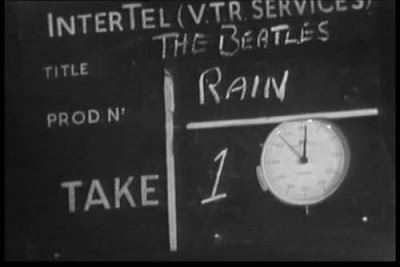 On 19 May 1966 The Beatles and the film crew (also from Intertel VTR Services, the same company that filmed the earlier music videos) gathered at Studio One at Abbey Road where they made three promo films for their single track “Rain” and six for “Paperback Writer”. Director was Michael Lindsay-Hogg. 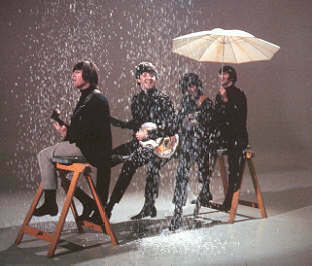 One of the promo films for “Rain” and one for “Paperback Writer” were shot in colour for the American market, while the rest were filmed in black and white. Video tape was used on this first day, while the following day's footage was shot on film. Intertel was a professional company dealing in video tape recording (V.T.R. ), and made sure that the colour clips were shot in NTSC/525 line, as they were specifically made for The Ed Sullivan Show. After lunch The Beatles recorded black-and-white versions for UK and European viewers, two for Paperback Writer and one for Rain, between 3.30pm and 6.15pm. These were all 405 line but was later transferred to t/r for some overseas sales. 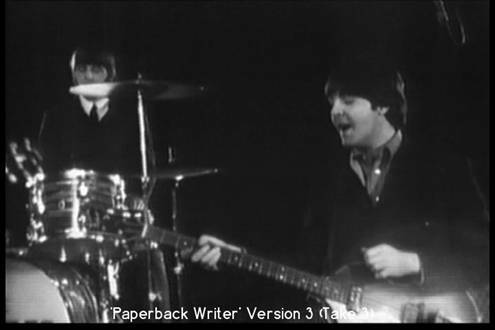 The first filmed black and white version of “Paperback Writer” aired on the final edition of Thank Your Lucky Stars on 25 June 1966 and the second black and white version of “Paperback Writer” as well as a black and white version of “Rain” aired on Ready, Steady, Go! on 3 June 1966, which was the first time the programme had broadcast footage not from its own studio. Paperback Writer version #1 (Take 1) *Colour “sitting Beatles version”, Clean (no applauses) for use in "Ed Sullivan Show"
Paperback Writer version #2 (Take 2) *b/w “sitting Beatles version”, different angles, for use in ‘Ready Steady Go’ June 3, 1966. 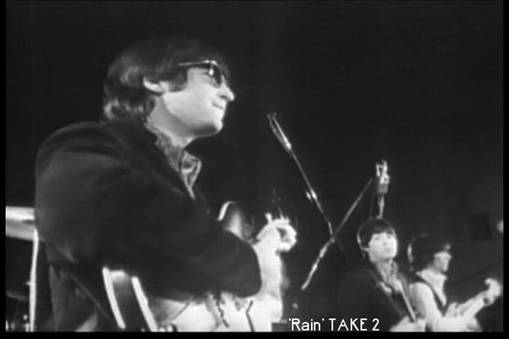 Rain version #3 (Take 3) *Colour & Clean (no applauses) for use in "Ed Sullivan Show"
On 20 May 1966 The Beatles and the Intertel film crew went to Chiswick House, an 18th century house and gardens in West London, to shoot one more promo film each for “Paperback Writer” and “Rain”. Both were shot on 35mm colour film. 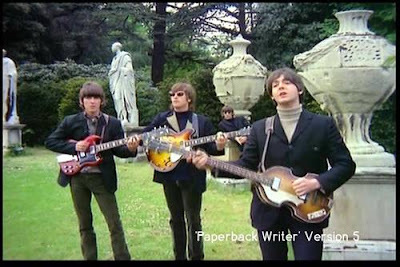 The film for “Paperback Writer” was more or less a straightforward performance clip, with most of the film devoted to The Beatles miming in the statue garden of Chiswick House. Both films were shot in colour, but they were aired in black and white on Top of the Pops, as the BBC had yet to make the shift to colour. 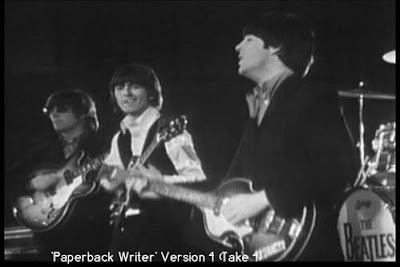 The Chiswick promo film for “Paperback Writer” debuted on 2 June 1966 on the show, while the Chiswick promo film for “Rain” debuted on 9 June 1966 on the show. 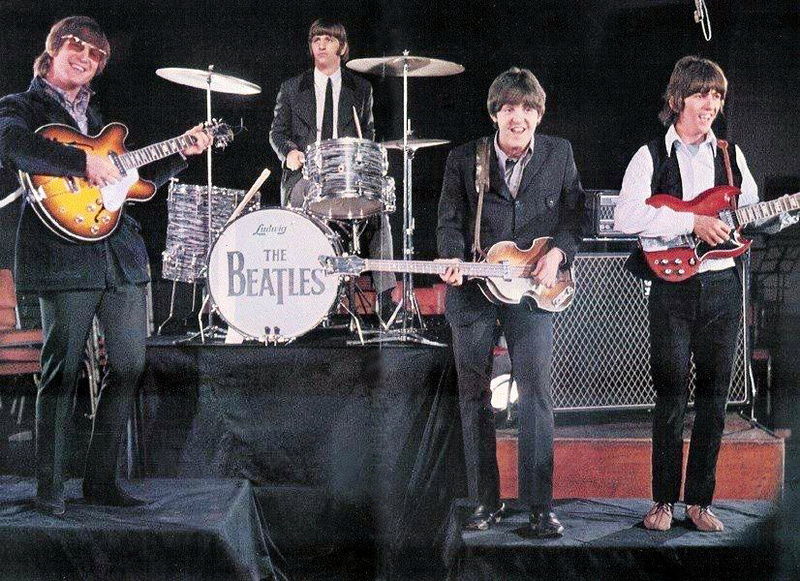 (1966/1996 –Anthology 2) *For original use in "Top of The Pops". (1966/2003 –Anthology DVD release) *For original use in "Top of The Pops". Rain (Colour with inserted outtake film) *As shown on ‘Anthology’ video, never released as individual promo clip, but worth mention it here. Tony Bramwell again produced the two promotional films for Subafilms. The film crew was provided by Don Long Productions. The director on both films was the German Peter Goldman, who had been recommended by The Beatles’ friend Klaus Voorman. 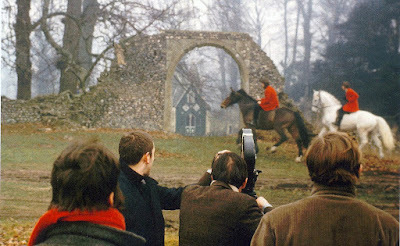 Filming Strawberry Fields Forever and Penny Lane at Sevenoaks. Shooting of the music video for “Strawberry Fields Forever” began on 30 January 1967 at Knole Park in Sevenoaks, Kent, and finished on the next day. Many of the films sequences centred on a dead oak tree in the park, under which sat a piano. 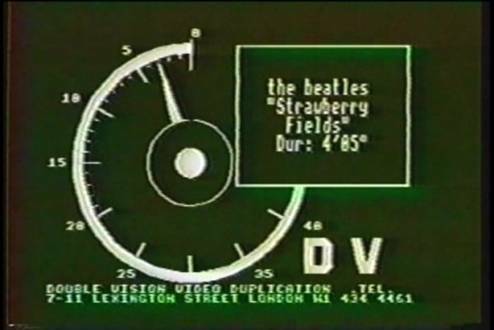 The “Strawberry Fields Forever” film uses a number of effects that had never been done before as far as promotional music films are concerned. The film includes jump cuts, reversed film, various speed techniques, etc. 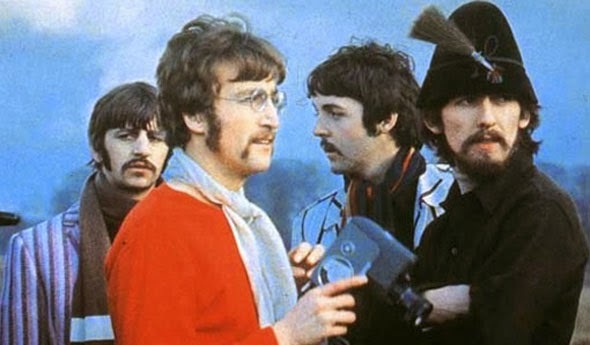 Along with the promotional film for “Penny Lane”, “Strawberry Fields Forever” has been named among the most influential music videos of the 1960s by the Museum of Modern Art in New York City. 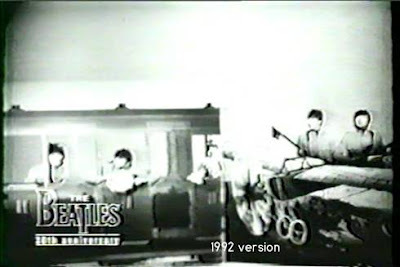 When the music video was shown during the Beatles' Anthology TV-series and later commercial releases of same, home movie footage shot by the Beatles themselves was inserted into the video here and there, thereby creating a new version of the video. The Beatles shot home movies of their own during filming. 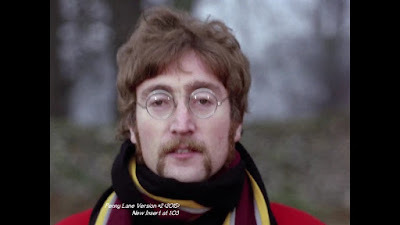 Strawberry Fields Forever (with inserted home movie footage shot by the Beatles themselves) *As shown on ‘Anthology’ video, never released as individual promo clip, but worth to mention here. 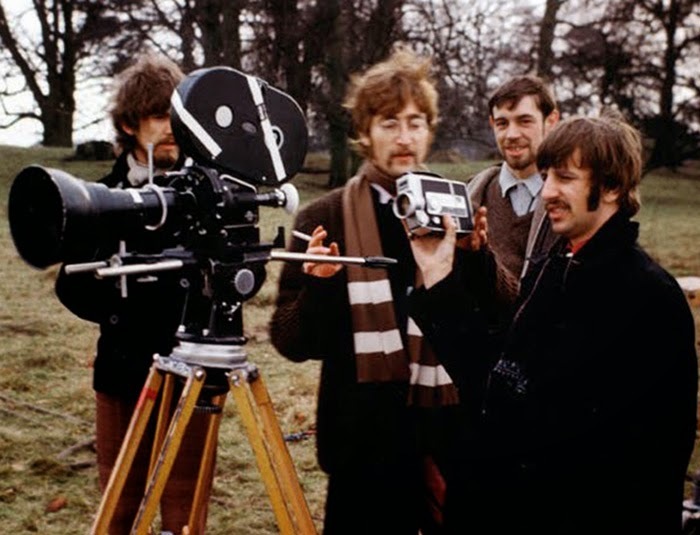 Shooting for “Penny Lane” began on 5 February 1967, and Peter Goldman later shot some additional footage without The Beatles at a later date. 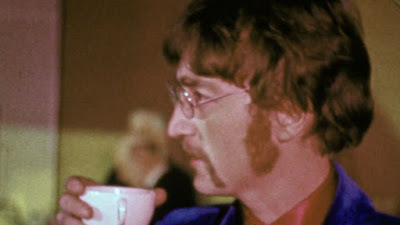 Even though “Penny Lane” was inspired by the street of the same name in Liverpool, only a few shots of buses, the barber shop, and “the shelter in the middle of the roundabout” were actually shot there. Most of the film was shot on Angel Lane in Stratford, London, with several scenes shot in Knole Park as well. As with “Strawberry Fields Forever”, The Beatles do not mime to the song. Instead they wander about Angel Lane and ride horses in Knole Park. 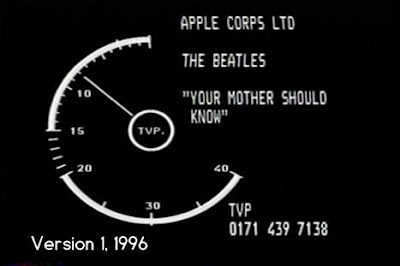 The promo clips for both "Penny Lane" and "Strawberry Fields Forever" were shown on Top Of The Pops 16 February, 1967, in glorious black and white. In the USA on February 25th 1967, both films were shown on the variety show The Hollywood Palace. 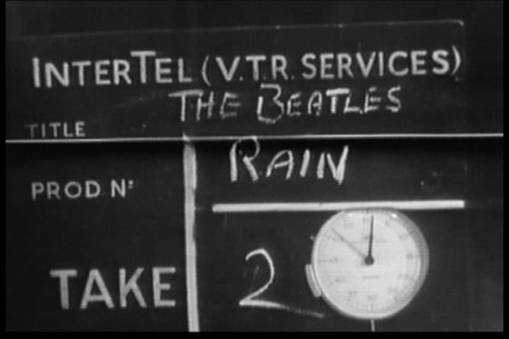 Of course, the films were also televised everywhere else in the world where the Beatles were popular, either in black and white or colour, depending on whether or not each country had made the switch. After this, the two films were largely forgotten about, and when the popular early eighties British television programme "The Tube" discovered a silent colour copy of the "Strawberry Fields Forever" film, they had no clue as to which song it was the music video for, and screened it to the audio of "Good Day Sunshine"! Inserted into the 2015 edit of Penny Lane. When Beatles fan and film archivist Ron Furmanek was put in charge of restoring the Beatles' music videos in the early nineties, the one film that was missing from the Apple Corps' archives was "Penny Lane". Both the 35mm camera cut negative and IP's are missing, probably stolen or lost ages ago, although they have all of the trims and outtakes. Furmanek ended up restoring "Penny Lane" from the colour copy from The Hollywood Palace TV show 2 inch tape from 1967. In 2015, the "Beatles 1" release used a faded film copy of "Penny Lane" as a starting point to rebuild the video. Partly restored, partly colourised, this version also inserted a few shots from the outtakes, making it a new edit/version. Still from the "A Day In The Life" music video. (1967/2015 –Beatles 1+) *the original film has the sound slightly in different synch, it was fixed by Apple in 2003 and restored in superb visual quality in 2015. (1996 –Anthology 2) *Includes different footage starting just before the first orchestra crescendo and until it’s end (this is the ONLY version where Mal Evans appears undisguised, for example). This version is also available on the ‘Anthology’ TV special/video and DVD, but incomplete. (2003 –Anthology DVD release) *This version is the same as #1, but fades 20 seconds earlier than #1 and 24 seconds earlier than #2. This is the shortest of all three. *All versions directed by Tony Bramwell on February 10, 1967. This clip was distributed to the media for individual promotion and it’s not the version that appears on the DVD release (see Version #2). A fourth promo clip for the song, credited to "Top of the Pops 1967", appeared as a bonus feature on the 2012 DVD release of a digitally restored version of the telefilm Magical Mystery Tour. 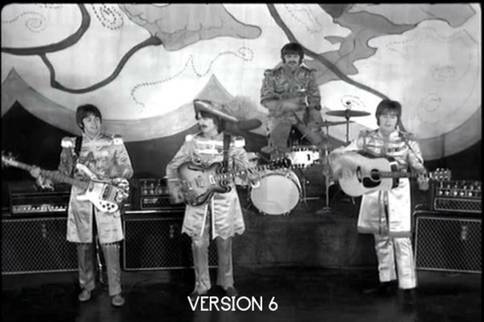 It is all in black-and-white and features all four Beatles as well as their then-girlfriends at an editing table in an editing room, handling film reels and editing a film referencing the song's lyrics by utilizing simple in-camera editing techniques to make people seen in a field "magically" appear and disappear. 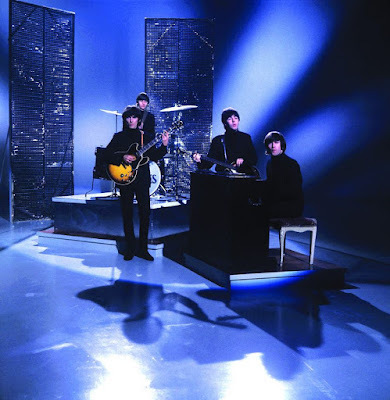 In 1996, a new version Lady Madonna clip was made, using footage from the first two, and editing in studio footage of the Beatles shot at other times, like from the Experiment in Television: Music! TV special. Never released on it's own as a promo video, many unofficial video compilation has featured this edit. 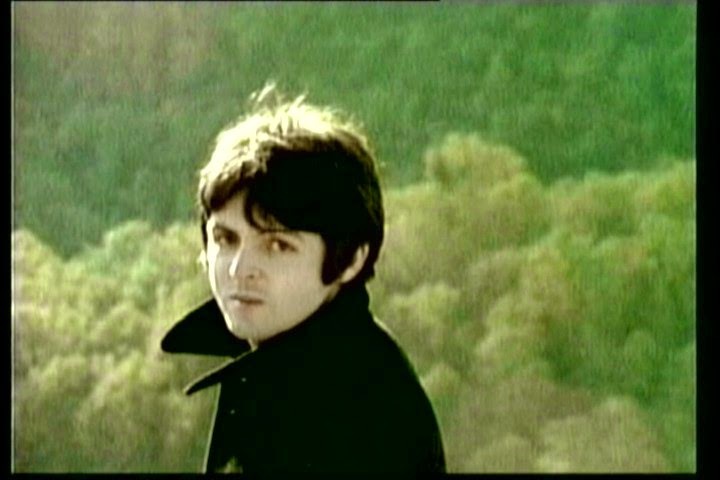 On 4 September 1968, the music videos for “Hey Jude” and “Revolution” were filmed. 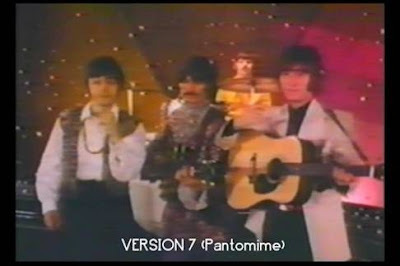 In order to get around the ban on miming, the vocals for both songs were recorded live, even though they sang over pre-recorded tracks. These colour music videos were directed by Michael Lindsay-Hogg, who had earlier directed the videos for “Paperback Writer” and “Rain”. 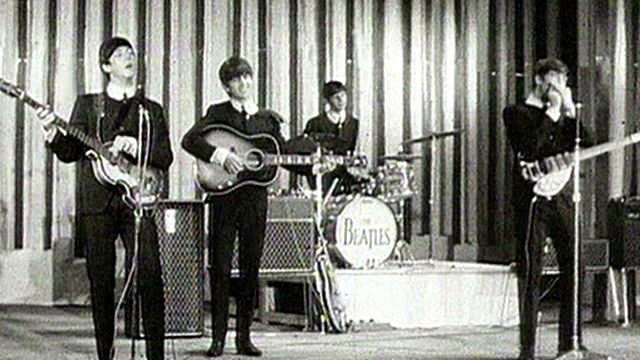 The footage for “Hey Jude” was shot with an audience, from which three individual but similar looking music videos would emerge: one for release to various television programmes around the world, one that would be shown on David Frost’s show Frost on Sunday in the United Kingdom, and one that would be shown on The Smothers Brothers Comedy Hour in the United States. 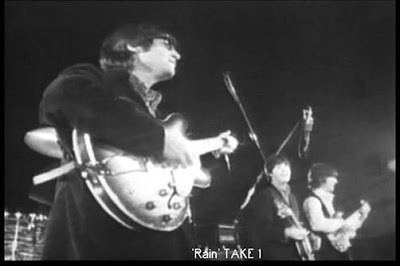 All three music videos would follow the same format, as straight performance clips in which an audience joins The Beatles for the final, long chorus of “Hey Jude”. The differences between the three promotional films were minor at best. The version shown on The Smothers Brothers Comedy Hour tended to be closer to the promotional film meant for general release, although there were a few subtle differences. At the same time that footage was shot for the “Hey Jude” promo films, and several introductions by David Frost was also shot for his programme, as well as a short instrumental version of the David Frost theme played by The Beatles. 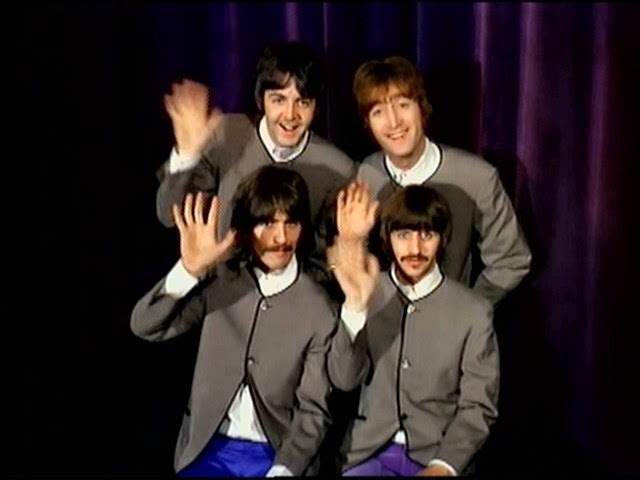 One of the promotional films for “Hey Jude” debuted on Frost on Sunday in the United Kingdom on 8 September 1968. Another made its debut in the United States on The Smothers Brothers Comedy Hour on 6 October 1968. 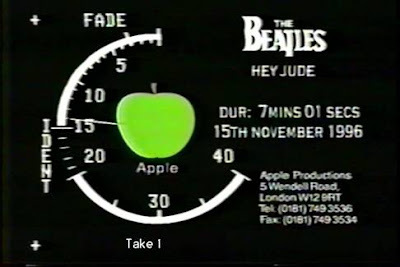 A fourth promotional film for “Hey Jude” was later created for The Beatles Anthology in 1995. This version was shorter than the other versions by several seconds, using a combination of clips from the three videos. (1996/2003- Anthology Video & DVD release) *The ‘Anthology TV’ version as shown on ABC in 1995, later released as home video and DVD, shows interview footage over the song, plus is not complete, but it’s also available in full as an individual promotional video, that’s the version described here. The recording introduction for ‘The David Frost’ show (two different takes) is not part of the video, it was recorded separately. While the footage shot for "Hey Jude" would result in three music videos, the footage shot for "Revolution" in between takes of "Hey Jude" would result in two versions. The Beatles again sang live to a prerecorded tape. One of the promotional films for “Revolution” would make its debut (and only contemporary screening) in the UK on Top of the Pops on 19 September 1968. 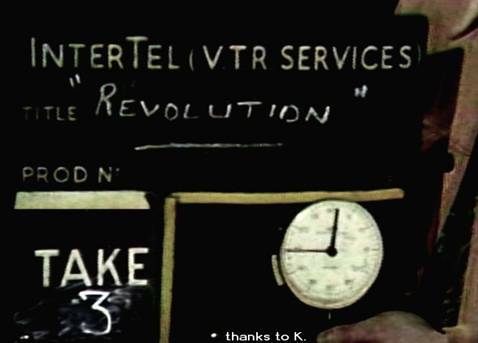 A promotional film for “Revolution” also aired in the United States on The Smothers Brothers Comedy Hour on 13 October 1968. Slate for take 3 of Revolution. The number 3 looks too white, though so it may be fake. (1968 –Smothers Brothers) *Same as Version #2 with additional applause. 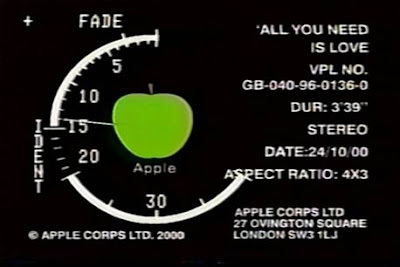 One of the films for “The Ballad of John and Yoko” aired in the United Kingdom on Top of the Pops on 5 June 1969. 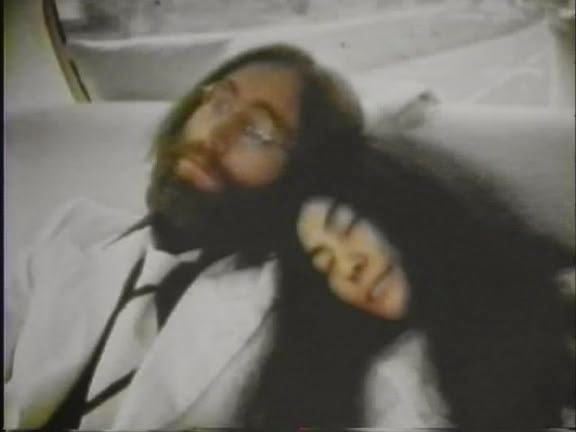 A music video for “The Ballad of John and Yoko” aired on the television show Music Scene in the United States on 22 September 1969. 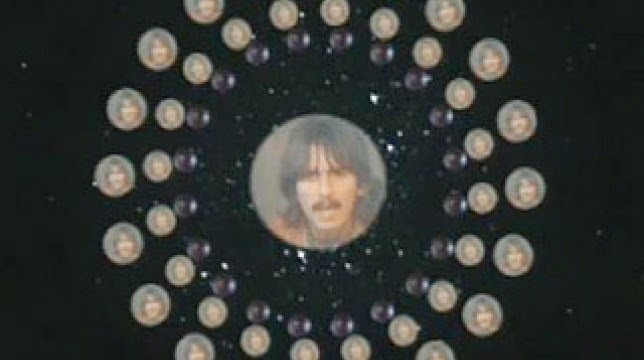 In The Beatles' Anthology, it is believed that the version of the music video shown there was a mixture of the previous two, this time using as many colour clips as possible. 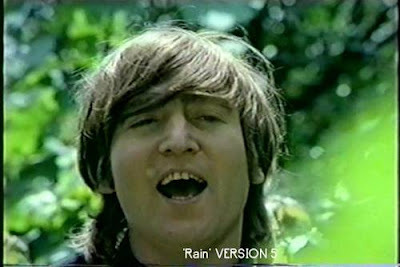 (1969/2000 – Beatles 1) *Version #1 starts with pictures of John & Yoko, that’s the easiest way to identify both versions. 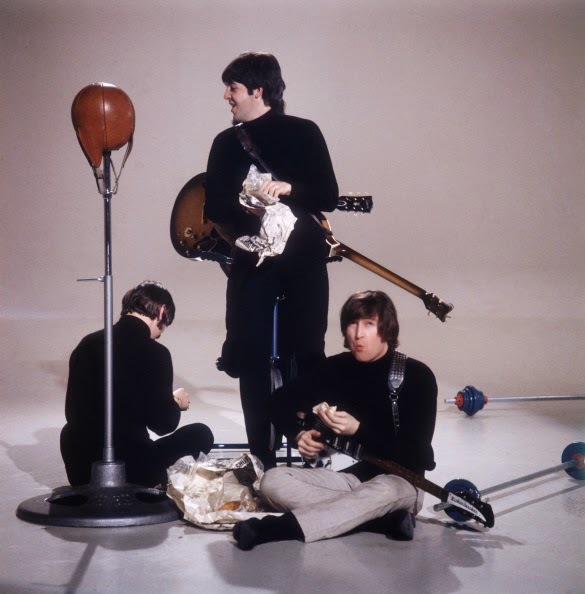 From outtakes from the January 1969 shooting of the "Let It Be" film, music videos were made. 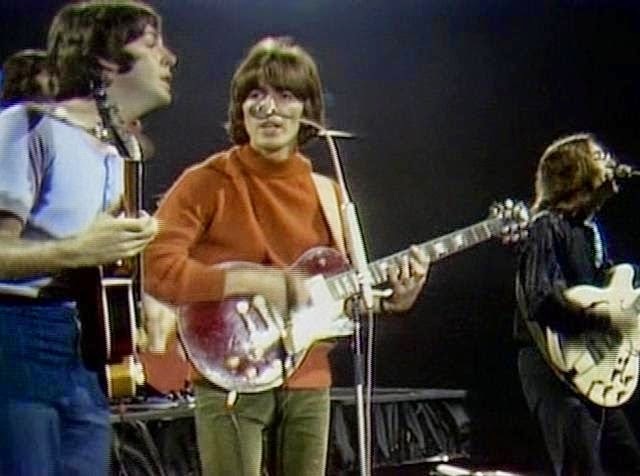 "Don't Let Me Down" premiered in colour on April 30, 1969 on The Glen Campbell Goodtime Hour in USA, and featured footage of The Beatles rehearsing in the studio as well as performance footage from the rooftop concert. 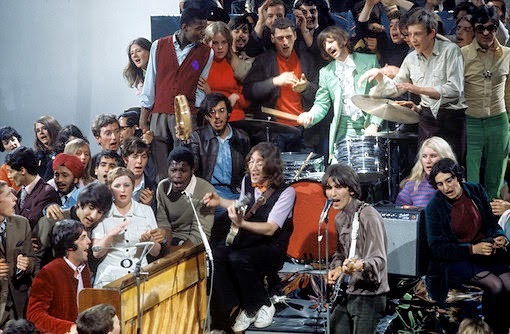 "Get Back" from the rooftop concert January 30, 1969 was aired on Top Of The Pops in the UK on 17 April, 1969 in black and white. The clip was reprised several times during the year, and on Christmas Day, it was shown in colour for the first time. 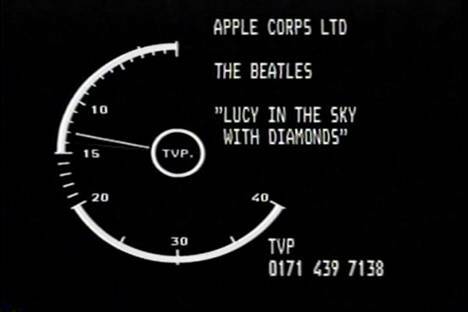 On 5 March, 1970, Top of the Pops showed a promotional clip of the Beatles performing "Let It Be" from 31 January 1969. The clip was repeated on 19 March. The clip of "The Long and Winding Road" from the film is likely to have been made available as a music video when the song was selected as a single in USA and other countries. It was present on Anthology and was also selected for ‘Beatles 1+’. The Beatles' last appearance on the Ed Sullivan Show was in form of a clip of "Two Of Us" from the "Let It Be" film, on March 1, 1970. Whether this was meant to be a music video is not known, but is likely. The clip was also used in remastered form as music videos in 1996 and 2000. 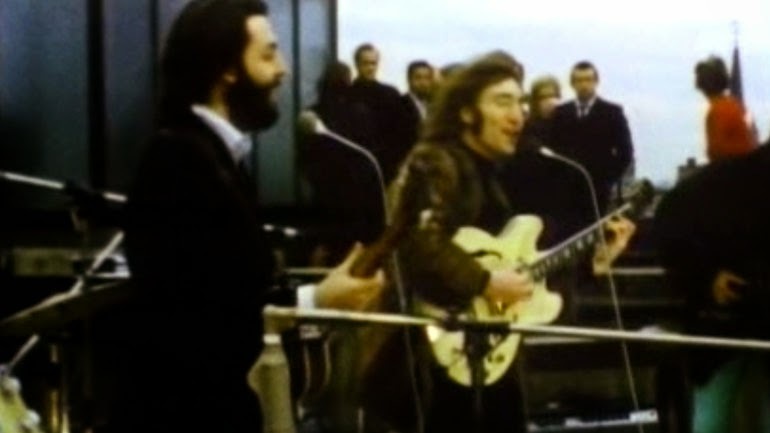 (1969) *Rooftop with audio from the single, uses different footage from the ‘Let it be’ movie. For use in "Top of the Pops", April 1969. (1969) *with outtake footage from ‘Let it Be’ movie. Uses the single version as audio. 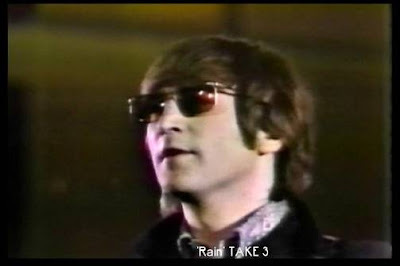 (1970) *with outtake footage from ‘Let it Be’ movie. Uses the single version as audio. The final music video made while all four Beatles were together as a band (unless one counts footage from the Get Back sessions) was “Something”. The single “Something”, backed by “Come Together”, was released on 6 October 1969 in the United States and 31 October 1969 in the United Kingdom, just as The Beatles were on the verge of breaking up - George Harrison's first Beatles single A-side. (1969/2000 – Beatles 1) *Directed by Neil Aspinall. Still from the "Something" promo, this is Maureen Starkey. Since the individual Beatles had drifted apart by this time, each of The Beatles and their wives at the time (George Harrison and Pattie Boyd, John Lennon and Yoko Ono, Paul and Linda McCartney, and Ringo Starr and Maureen Cox) were shot around their respective homes. 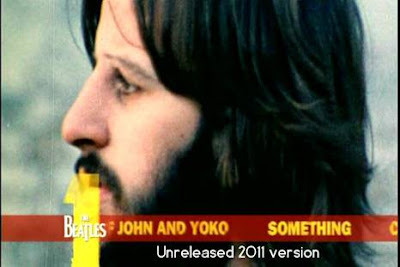 The individual footage was then edited together to create the promotional film for “Something”, very reminiscent of how the 1969 Christmas flexi disc was made. The film was directed by Neil Aspinall and premiered in the UK on Top of The Pops 13 November, 1969. (1976 – Rock ‘n’ Roll LP) *Both versions uses different archival footage from many Beatle periods. Nothing exclusive. 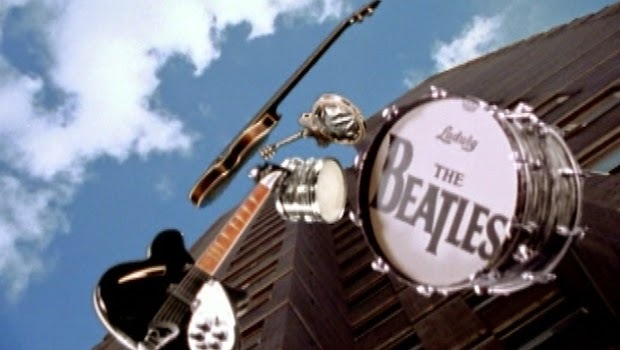 Next up was the music video for "The Beatles' Movie Medley", a single made to promote the compilation album The Beatles: Reel Music, as well as to capitalise on the success of the Stars on 45 cover version single. 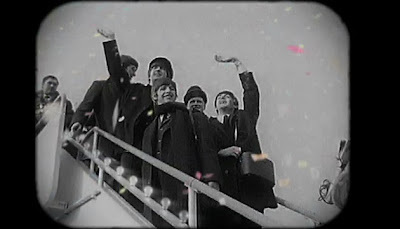 The music video was made up of clips of Beatles songs from their motion pictures and the Magical Mystery Tour TV-film, in itself a compilation of music videos held together by a thin plot. Also used was a clip from the "Our World" performance of "All You Need Is Love". The footage was put together by Ron Furmanek. (1982- Reel Music LP) *With footage from the movies and Our World. In 1982 and 1983, music videos were made for the 20th anniversaries of "Love Me Do" and "Please Please Me", utilising a short, mimed performance of the former and Washington DC concert footage of the latter, interspersed with unrelated clips from newsfilms and TV-shows. Ron Furmanek was involved in the creation of these two videos, and is billed as co-director and co-producer. Miming to a part of "Love Me Do" at the Little Theatre in Southport in 1962, later used in a 1982 music video. (1982 - 20 Greatest Hits) * Three, not two as sometimes reported, were produced by David M Blum and Ron Furmanek, all three using footage from ‘The Mersey Sound’ TV show. Version #1 is a combination of ‘Mersey Sound’ and pictures from the EMI sessions, this version (editing out the intro and outro with The Beatles logo) was also used on the Anthology video, it was NOT created in 1995 for this project, since it’s available along with #2 since 1982 as part of an EMI In-house video. 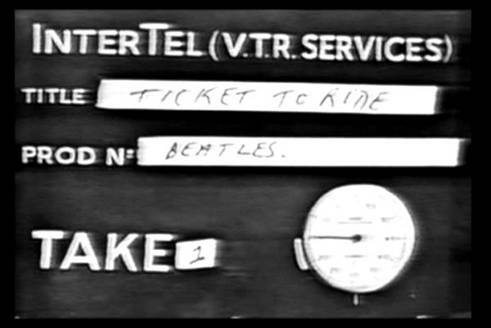 Version #2 incorporates more archival footage (airport arrivals, with fans, backstage, etc) and less ‘Mersey Sound’ footage. This is the rarest of the three. And version #3 uses completely different off-stage footage compared with #2, along with some color footage from ‘Come to Town’, plus Washington 64 concert, and ‘It’s The Beatles’ TV show, just to help you identify this version. *Versions A & B directed by Ron Furmanek; Version C directed by Jim Yukich, David M. Blum and Furmanek; and all use the Washington 1964 concert as base. The intro and outro has the original concert audio, and the studio version is used later. 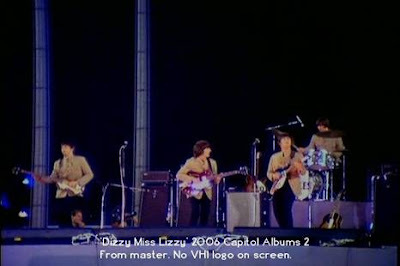 Version A adds footage shot at EMI Studios during the recording of "And I Love Her" and other archival video; Version B shows only Washington concert footage, while Version C adds photos and more off stage archival footage similar to Version A but with different effects. In 1983, Capitol Records made a music video for the 20th anniversary of the "I Want To Hold Your Hand" single. 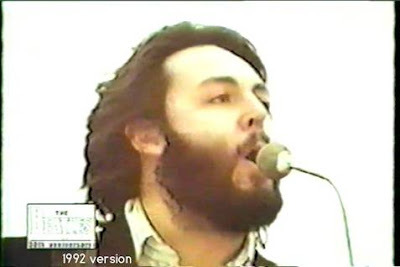 Made from old stock non-performance footage, the clip was shown on Friday Night Videos, on the 10th of February, 1984 with Paul McCartney also appearing on the show. Again, film archivist Ron Furmanek was involved in the creation of the video and is credited as producer. The single was also reissued in USA, this time with Paul McCartney's cigarette airbrushed away from the cover photo. (1983 - 20 Greatest Hits) *Uses archival footage from many sources, like "Big Night Out" TV show, ‘It’s The Beatles’, Washington 64 concert, etc; and starts with the audio from "Sgt. Pepper" (“It was twenty years ago today..”) and a long intro. The audio also includes girls screaming at the beginning and end of the song. (1984) *Both versions directed by Ron Furmanek, this one uses different footage from Version #1, and does not include the long ‘Pepper’ intro or applauses. (1987 -20th Anniversary) *Animated ‘Pepper’ album cover from the ‘It Was 20 Years Ago Today’ documentary. Sometimes used as a promo video for this song, at least in fan made promo video compilations. 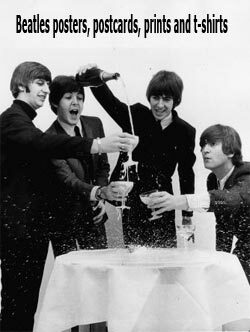 An anniversary year, in 1992 it was thirty years since The Beatles released "Love Me Do" on EMI. A bunch of videos with an anniversary logo was made available to television companies. (1992 - 30th Anniversary/Version 3, Shea Jacket) *With ‘Beatles Anniversary’ Logo on Screen. (1992 - 30th Anniversary) *With ‘Beatles Anniversary’ Logo on Screen. (1992 -20th Anniversary) *Same as Version #1, with ‘Beatles Anniversary’ Logo on Screen. Apple is back. With Apple on board again, the contract issues between The Beatles and EMI having been settled, the older Beatles music videos are being provided by The Beatles' company for promotional use. In 1993, with the compilation albums "The Beatles 1962-1966" and "The Beatles 1967-1970" (aka "the red album" and "the blue album") coming out on CD for the first time, several music videos were distributed to TV companies around the world, probably the newly restored versions by Ron Furmanek, which also sported new soundtracks. 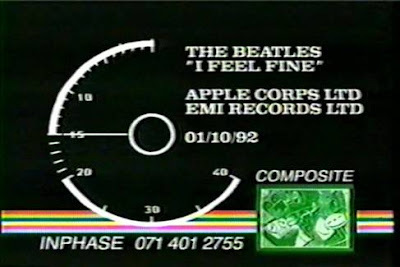 A promotional video cassette featuring short edits of a few of the clips were also made, but the full videos were only available to television stations. These clips were treated with either a prominent, rather large Apple logo on the screen, or with the frame of the screen either decorated in red (for the red album music videos) or blue (you get the picture). 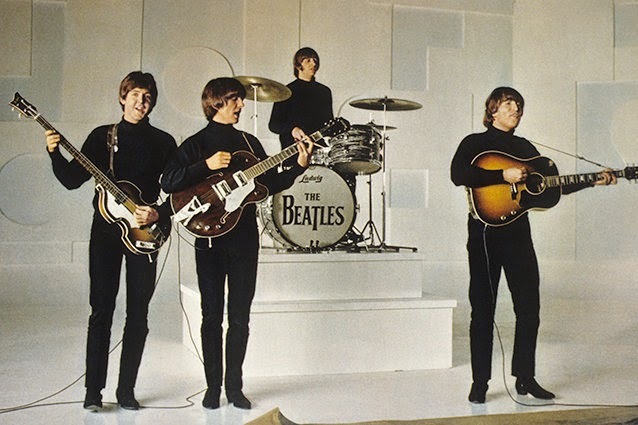 November 1, MTV Europe declares it's "Beatles Day", by showing, at regular intervals throughout the day, brand new exclusive interviews with Paul and George, the November 1965 Intertel studio promotional film clips, plus the original films for "Hello Goodbye", "Something" (the first complete television screening anywhere in the world since 1969), and the TV film "Magical Mystery Tour". All music videos as well as the "Magical Mystery Tour" TV special were supplied by Apple Corps Ltd.
(1993 –Blue Album 1976-70) *From the MMT movie. In 1994, a 4-track EP was made to promote the new collection of Beatles BBC performances, and a couple of music videos was made for the main track, "Baby It's You". Directed by Mark Haefeli and edited by Jeff Wurtz. 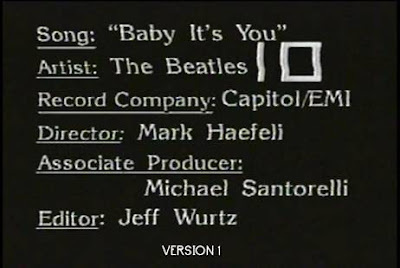 Baby It's You - version #1 (w/slate) *This is the less know version, starts with girls screaming and shows archival footage from EMI studios & scenes from AHDN. (1994 – Live at the BBC) *Both directed by Mark Haefeli, this is the known version, completely different from Version #1. (1994/1996 – Live at the BBC/Anthology 2) *From Paris concert. 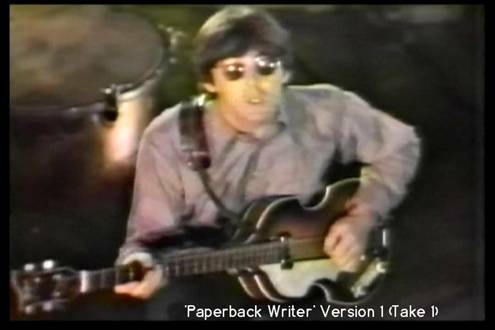 (1995 –Anthology 1) *From ‘Around The Beatles’. (1995 –Anthology 1) *From the Washington 1964 concert film. The music video for “Free as a Bird” was produced by Vincent Joliet and directed by Joe Pytka. It was shot as if from the point of view of a bird, who as he is flying travels back through time and The Beatles’ career. There are several allusions to The Beatles’ songs in the video, including the pretty nurse who was “selling poppies from a tray” from “Penny Lane”, Strawberry Field from “Strawberry Fields Forever”, and so on. A "Making of..." video was also made. (1995/2003 – Anthology TV/Anthology DVD release) *Directed by Joe Pytka. 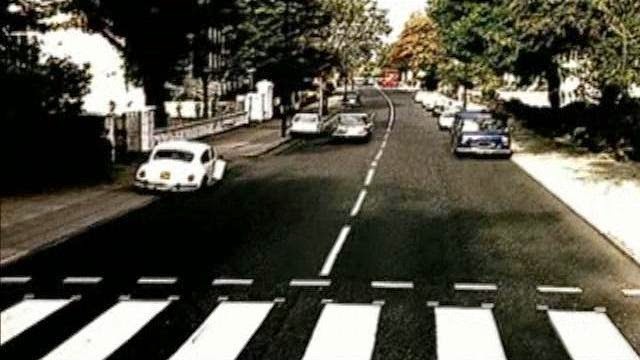 The Abbey Road scene was recreated in the "Free As A Bird" music video. (1996 –Anthology 2) *directly from the movie. (1996/2000 – Anthology 2/Beatles 1) *From Ed Sullivan. 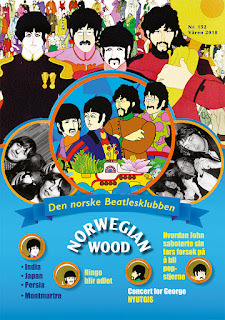 (1996 - Anthology 2) *From the "Yellow Submarine" movie. (1996 – Anthology 2) *From the "Yellow Submarine" movie. 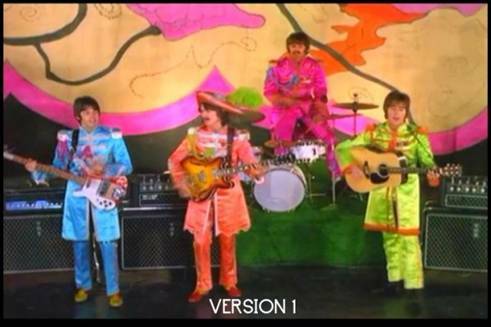 (1996 – Anthology 2) *From the "Magical Mystery Tour" TV-film. (1996 – Anthology 3) *From the "Let it be" movie with original audio from the soundboard mix, not from the film. 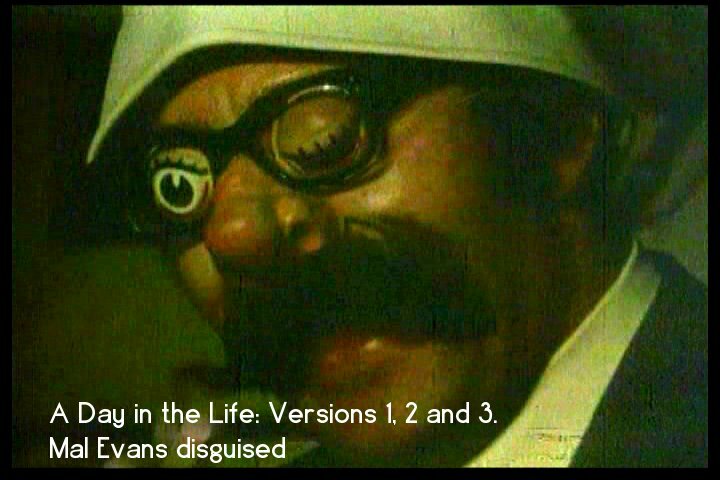 (1996 –Anthology 3) A new edit, only featured in Anthology. Directed by Tony Bramwell during the ‘Hey Bulldog’ session on February 11, 1968. 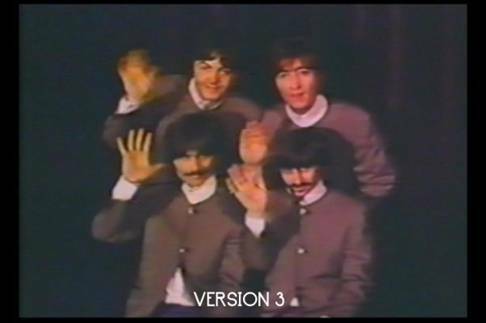 Promoting the new restored, remastered and and remixed "Yellow Submarine" film on VHS and DVD, a new video was made for the song "Hey Bulldog". 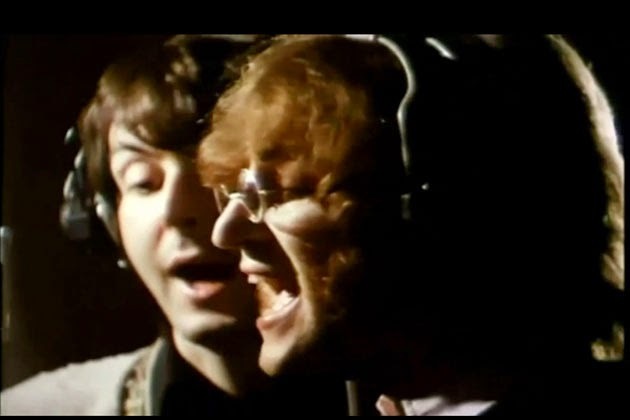 They were in luck, as the original recording session had been filmed in order to make the 1968 music video for "Lady Madonna". The footage works a lot better when used to illustrate the actual song they were recording! The "Hey Bulldog" video was distributed to TV stations and later made available as an iTunes download. 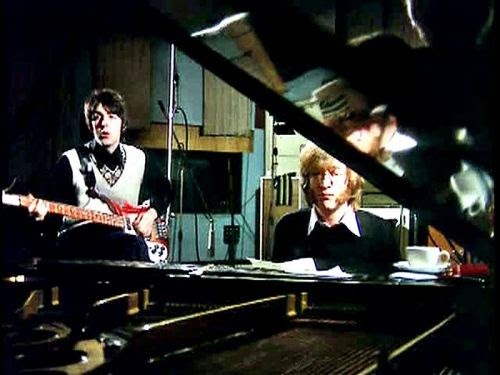 (1999 –Yellow Submarine Songtrack) *Rebuilding the studio footage shot by Tony Bramwell in 1968 and used to make the Lady Madonna promo films. 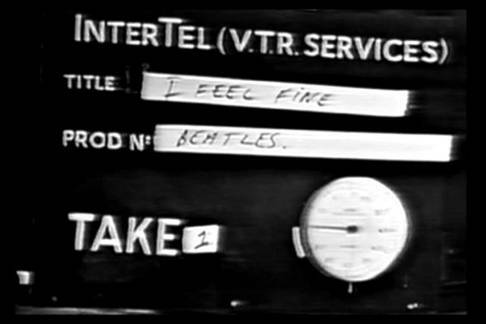 (2000 – Beatles 1) *As shown in the ‘Let it Be’ movie, but with original audio from the soundboard mix, not from the film. 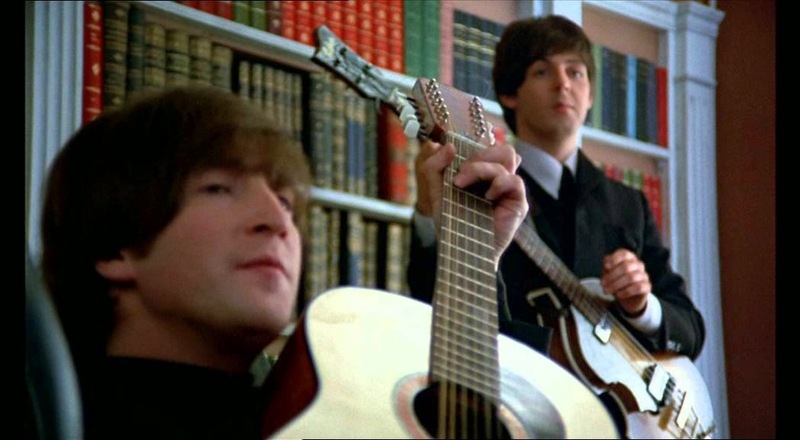 (2000 –Beatles 1) *From the movie. (2000 –Beatles 1) *Animated flash video. 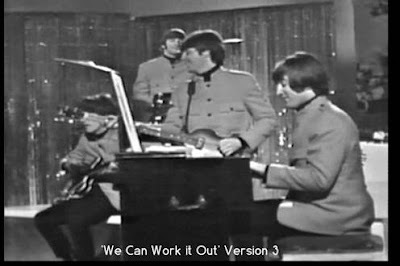 (2000 –Beatles 1) *Even when it was filmed and recorded back in 1967, available in black and white as part of the ‘Our World’ broadcast, and that it was included in colour (except for the intro) on the Anthology video in 1995; it was never released as separate videoclip until year 2000, in full colour. Many fans use the "Our World" live broadcast as a "video", but that’s just a simply TV broadcast. (2000 – Beatles 1) Just a new slate for this second 1969 version. 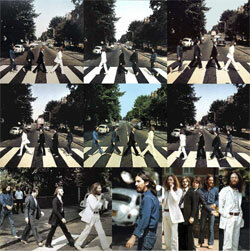 (2000 –Beatles 1) *Intro and Outro for this version is Black & White. 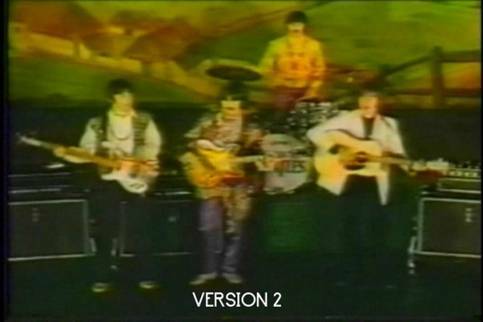 First available almost complete on ‘Anthology’ video, this version was not released as individual clip until year 2000. (2003 -Anthology DVD release) *From the "Ed Sullivan Show". 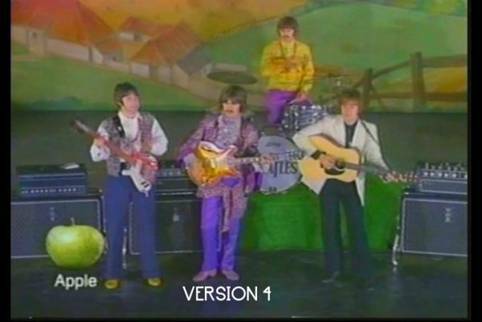 (2003 – Anthology DVD release) *From the "Magical Mystery Tour" TV film, almost the same as Version #1 but this ends few seconds earlier. 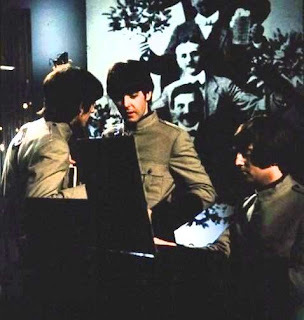 (2003 – Let it Be Naked) *An example of turning film footage from the Get Back sessions into black and white and augmenting the video with animated pencil drawings in the background. The clip was directed by Matt White of Supergrizzly Ltd. 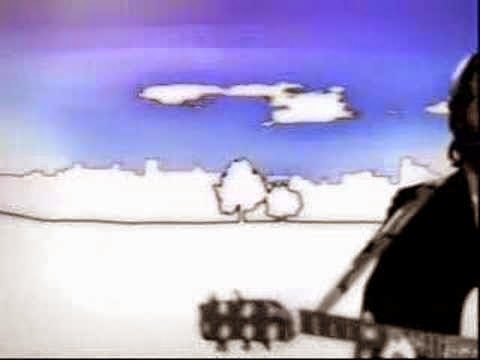 Still from the animated "Two Of Us" music video. (2003 – Let it be Naked) *Newly created video using Rooftop outtake footage from the movie. 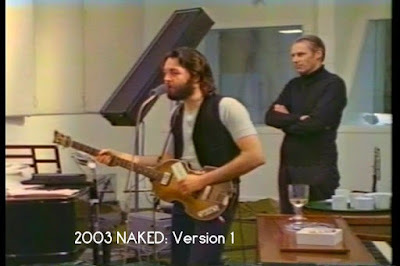 (2003 – Let it be Naked) *Newly created video using outtakes footage from the movie. This was called “Version 1” and uses mixed footage from Twickenham/Apple, with unique footage NOT on the Naked “Version 2” which we will call Version #5 (below). 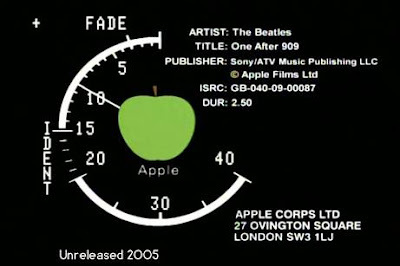 (2003 –Let it be Naked) *This was called ‘Version 2’ for the 2003 release, the first half uses Twickenham footage and the second Apple studio footage, also with unique scenes NOT on ‘Version 1’ from Naked (above). (2005 – Apple Master) *From "Ed Sullivan Show" in superb quality. (2005 – Apple Master) *From "Around The Beatles" in superb quality. (2005 – Apple Master) *From the "Help!" movie. (2005/2009 – Apple Master) *From the "Let it Be" movie in superb quality, audio from the soundboard mix in stereo. This video was broadcast on Japanese TV. 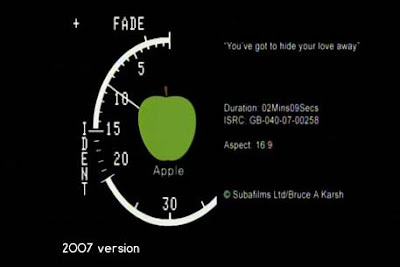 (2005 – Apple Master) *Almost same as Version #2 (no extra intro and outro though) but here in superb quality, the audio mix is slightly different erasing the “hiss” from the original source. *Some of the clips were later used for the 09 09 09 (year 2009) promo campaign in some countries, but it’s not confirmed, except for ‘One After 909’. (2006 – Capitol Albums 2) *From "The Beatles at Shea Stadium" TV concert film, remastered both audio & video. * All the videos were extracted from the remastered "Help!" movie, but each contains unique Apple slate and year 2007 at the end. These were sent to TV Stations, VH1 Classic made a special using them (without the slates). The mandala shapes and silhouettes were designed by Richard Hogg at Airside, Flame by Gary Brown at Munkey and Jason Watts & Steve Murgatroyd at Finish, 3-D by Tim Bacon, Daniel Sidi and Paul McBride, 2-D by Murray John, Roly Edwards and Camille Macmillan at Airside, and Shake by Byron Woolfindon at Finish. Tim Bacon designed the mathematically brilliant 'Cello Tunnel' at the end, while Andy Horner & Russell Farr shot and lit the ink and water effects created by Ray Spencer. 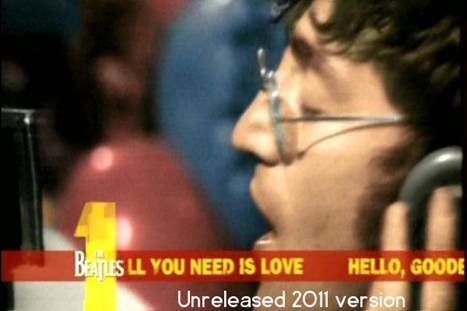 (2007 – Love) *Directed by Simon Hilton using psychedelic collage of images, effects and Beatles footage. Broadcast on VH1. In 2011, seven short snippets from the music videos were uploaded to The Beatles' official YouTube channel, ranging from 31 seconds ("Help! 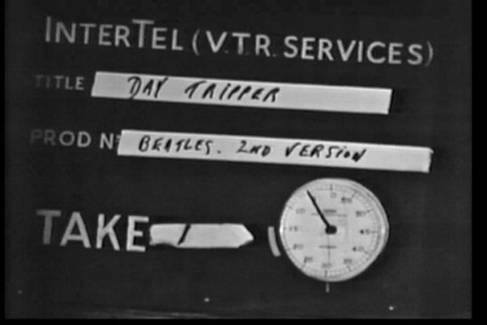 ", "Paperback Writer", "Penny Lane", "I Am The Walrus") to 1 minute, 11 seconds ("Strawberry Fields Forever"). Rounding out that collection of clips were "Hello Goodbye" #3 (1 minute, 7 seconds), and "The Fool On The Hill" (1 minute, 5 seconds). 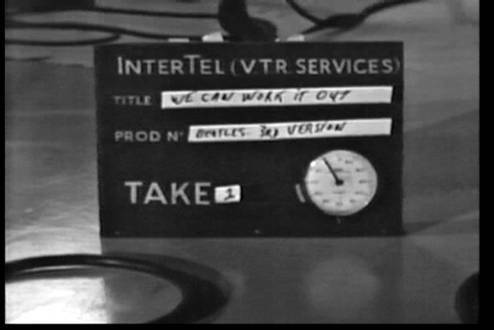 No release followed, but it can now be revealed that a version of the new "Beatles 1" was in the making. (2011 – Beatles 1 Remastered) *Same as Version #1 but with "1" Logo. (2011 – Beatles 1 Remastered/Version 2 used) *In superb video quality but with "1" Logo. I Want To Hold Your Hand from unreleased "Beatles 1" version 2011. 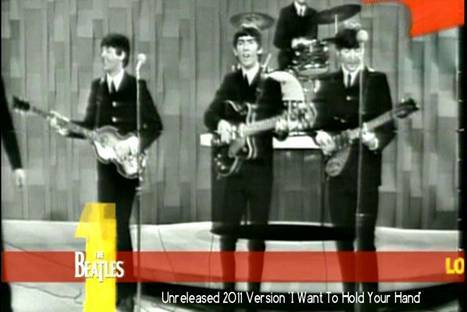 (2011 – Beatles 1 Remastered/Sullivan Show 3 used) * longer introduction compared with Version #3, also zoom in was applied for all the video. 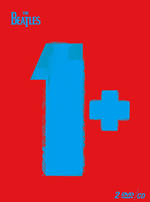 With "1" Logo. We can be happy that Apple reconsidered the project, and for 2015 we were presented with a new approach, abandoning these huge logos on the bottom of the screen. In 2013 a music video for a BBC recording of "Words of Love" was made by merging old newsfilm footage with new animation and drawings. Produced by Jonathan Clyde and Katrina Lofaro for Passion Pictures NYC, the video was directed by Lee Gingold and Giles Dill. The company researched stories and footage from 1963 - the year The Beatles progressed from being the opening act on tour to very much the main event. 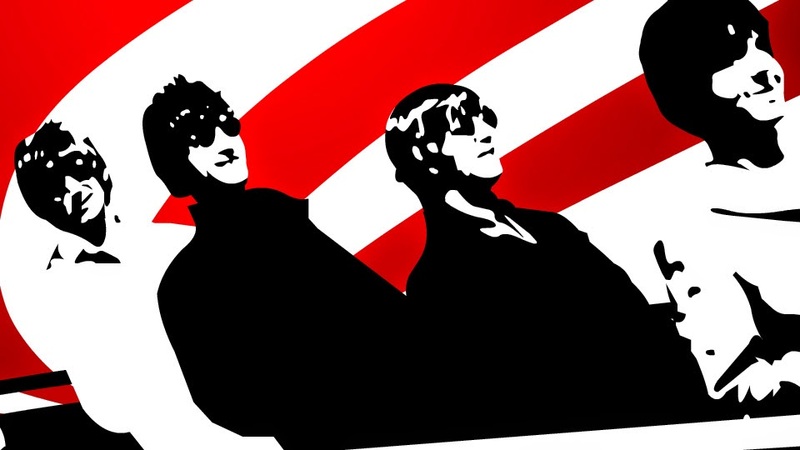 The resulting video captures that heady period with a combination of archive news footage, material shot by director Richard Lester for the Fab Four's first movie A Hard Day's Night, and original frames of animation that create a narrative, part based in the fact of the band travelling Britain during the freezing winter of 1963, with an added whimsical graphic element. (2013 – On Air:Live at the BBC Vol. 2) *Directed by Lee Gingold and Giles Dill. A "Making of..." video was also made. A new release of "Beatles 1" was announced, with new stereo mixes and with an accompanying video disc with promotional videos, also available in new surround audio mixes. 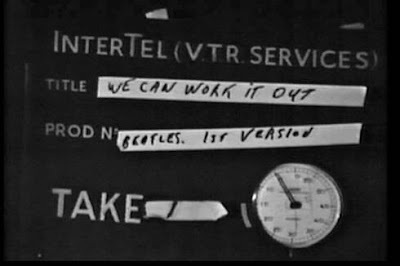 An expanded edition, "Beatles 1+" was also announced, containing a second disc featuring the videos that were not on "Beatles 1", due to these songs not having hit the no. 1 spot on the UK and USA charts. The original promos were used to a large extent, but for the songs that didn't have promo clips, other footage was used to create new promo films. 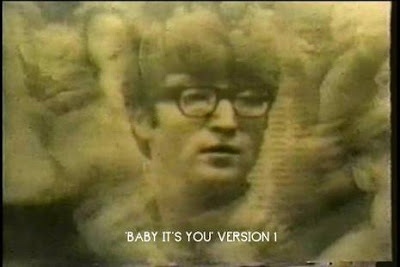 Baby It’s You Version #3 *Similar but not the same as version #2, adds more 8mm home movie footage outside BBC studios. Outtakes from the filming of the original Penny Lane has been inserted throughout. 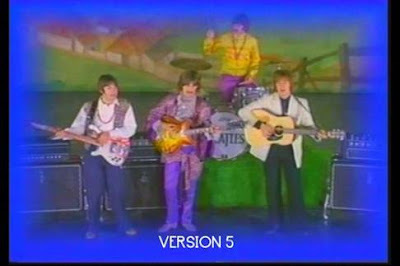 Hey Jude Version #5 (2015- Beatles 1+ Disc Two) *Another new edit using footage from takes 2 and 3, and the main audio from Take 2. Revolution version #4 *New audio mix and also fixed, new video edit from Version #2, plus 14 seconds from Version #1. Let it Be Version #3 *similar to version #1 with new inserts. Hey Bulldog Version #2 *New edit with fixed scenes in correct sequence. 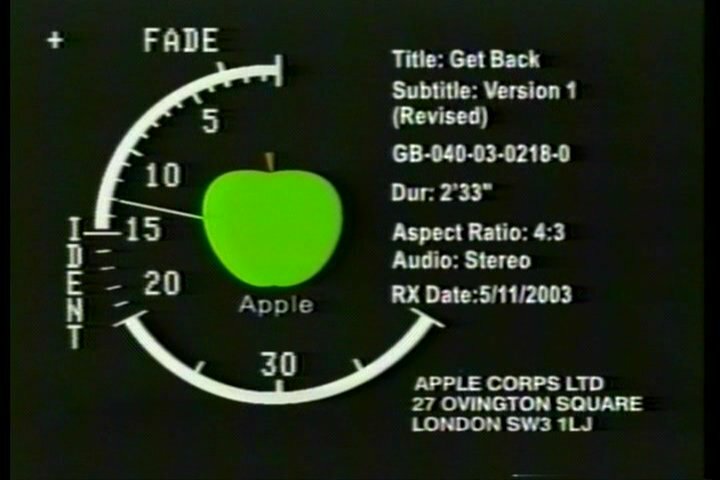 Get Back Version #6 (2015- Beatles 1+ Disc Two) *A new edit from the two available versions from 2003 (Let it be... Naked), the differences here starts when they move to Apple Studios and until the end. 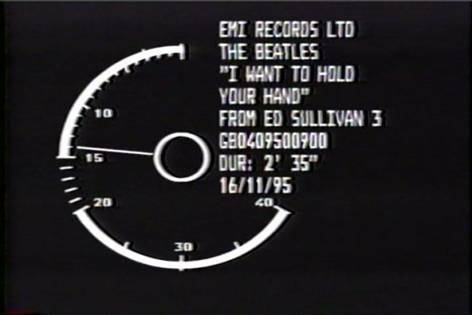 Yesterday (From Ed Sullivan) *Already available as "video" since 1996. 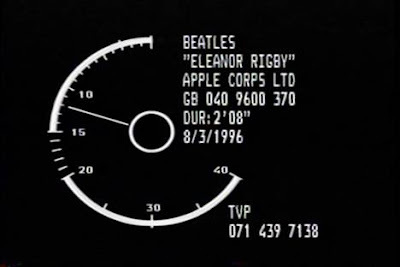 Eleanor Rigby (From Yellow Submarine) *Already available as "video" since 1996. 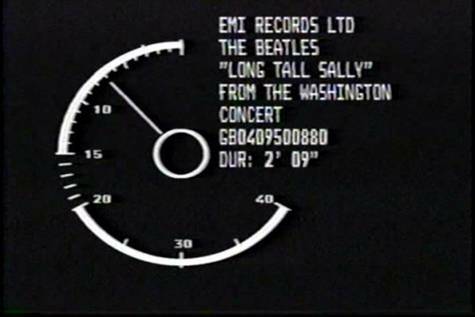 The Long and Winding Road (From Let it Be) *Already available since 1995 on Anthology video. Also broadcast in 1970 but no different from the movie. The best quality promo compilation so far is the new Misterclaudel massive 5 DVD boxed set "Promo Collection" (with the only mistake that a fake promo for "Come Together" taken from Beatles at Abbey Road home movie footage was included as an official 1982 video), plus Misterclaudel's "Intertel 1965" and "Intertel 1966" DVDs to get at least, 80% of the videos described here. 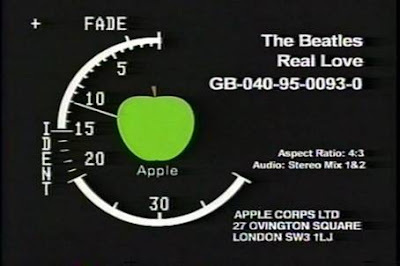 Quality is superior to any other bootleg release to date, but it obviously not better than "Beatles 1+".